I dine on my super yummy Fromm Four-Star Nutritionals Pork & Peas Recipe twice a day. It's slow-cooked pork and peas with an assortment of handpicked fruits & vegetables (including pineapple, mango, and melon) which provide high quality, easily digestible carbohydrates. It gives me a well rounded, balanced nutrition without the silly and unnecessary fillers! This yummy recipe also supports the health of my coat and skin with guaranteed levels of Omega fatty acids and is also enhanced with probiotics to ensure that my digestion is right on track! This stuff is grain free and made with quality ingredients found in the United States with no artificial colors, flavors, or preservatives... 'cause who wants all that yucky stuff in their food! 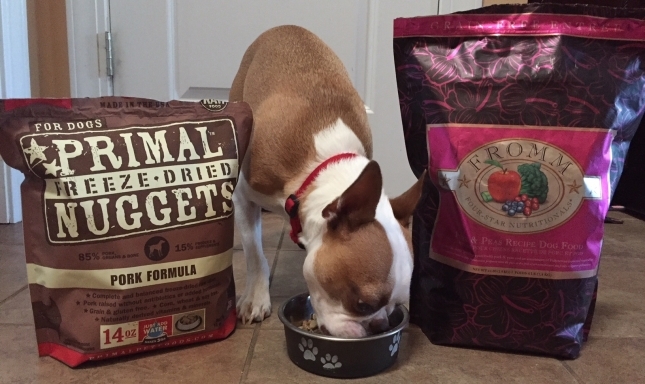 Mommy also adds a Primal Freeze-Dried Pork Nugget to my Fromm. It offers all the benefits of a safe and wholesome raw-food diet—without mommy having to grind, chop, measure or mix the ingredients herself. The Primal people take great pride in sourcing only the best ingredients, so this tasty and nutritious food is packed with naturally derived vitamins and minerals. The high-protein ratio appeals to my primal diet [insert wolf howl here], and is an excellent way to maintain a my svelte weight and boost my overall health. I lick my bowl clean at every meal! For Treats, I get Charlee Bear Crunch Grain Free Bacon & Blueberry Dog Treats are healthy, grain-free dog treats made with wholesome ingredients. They have the light crunch and contain less than 3 calories per treat, so I can have one EVERY TIME I'm a Good Boy! They were perfect when I was doing my my training classes because they are grease free—which makes them pocket friendly so they don't mess up mommy's pants and are ready to reward anytime. 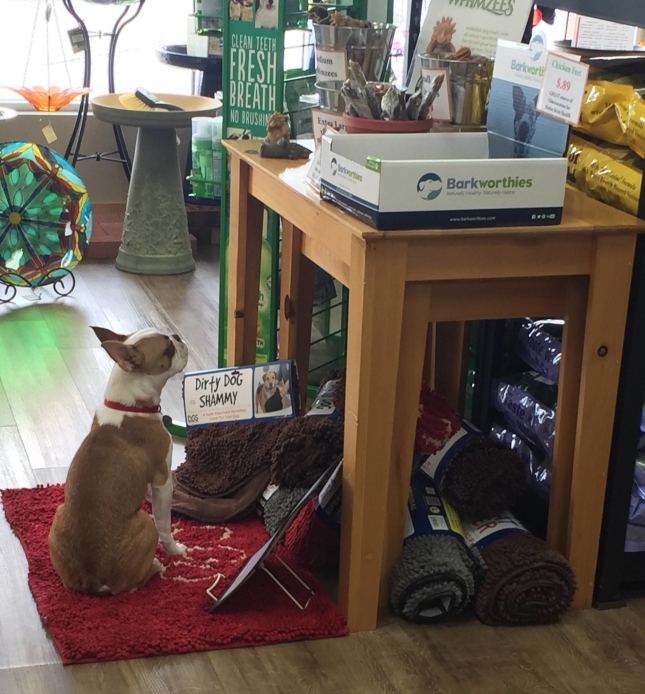 I also a Barkworthies Chicken Feet Dog Treat every time I come to work! Despite being hideously ugly, these chicken feet are all-natural dog chews that are high in protein yet low in fat. They are fully digestible, 100% healthy and 100% safe… even the toenails! No chemicals, hormones or additives, these healthy dog treats are a natural source of glucosamine to aid in joint pain and mobility. Made only of all-natural chicken, these single-ingredient chews also promote healthy teeth and gums through the provided gnawing action! When I get to work, I make a beeline for the Chicken feet and will wait patiently until DD or Cheryl bestow one upon me... I love those ladies! Home > Frank's Corner > • What is Frank eating?